I don’t think I can remember the last time I taught myself anything. It’s just too easy to Google everything isn’t it? Googling something isn’t really learning anything though, it’s more often just a way to prove to your mates that you were right about that thing you had an argument about in the pub, before you both remembered you could just look it up. Then, of course, once you’ve looked it up, you promptly forget it all because you’ve established who was right in the argument, not what the argument was about. Ah, friendship. And while it might be a long time before schools and educational establishments are done away with, there does seem to be an online tutorial for pretty much everything these days. If you’ve ever wanted to play the recorder with your nose but didn’t know where to start, here’s an online tutorial for you, my avant-garde musical friend. Thankfully, there are still people out there willing to teach themselves new tricks, not from online tutorials or even from books or qualified teachers. Instead, they’re teaching themselves these things through sheer brute determination, a large portion of willingness and some impressive athleticism. The Bucket List Boys are those people. Through a series of kinda weird but pretty inspiring videos, the Bucket List Boys are achieving new goals and learning new skills one stunt at a time. Just 3 friends that want to live life to the fullest and help others do the same along the way. The videos range from taking a bath in a million Froot Loops, exploring the catacombs beneath Paris to learning how to Ollie in a day. The one that caught my eye was learning how to backflip in under six hours. It just seemed to sum it all up – something challenging with a great sense of achievement at the end of it, but – let’s be honest – ultimately pretty pointless. I can’t think of any situation where I’ll need to backflip my way out of it. But then again maybe that’s because I just sit at home Googling things and playing the recorder with my nose. 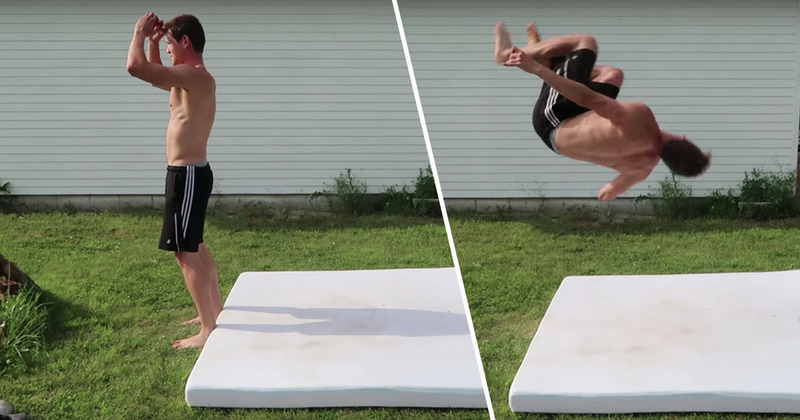 …always wanted to learn how to do a backflip but for years has been told he is too tall. Today he set out to prove that the only thing holding you back in life is your mind. Turns out all you need to do a back flip is a mattress in your garden, six hours of free time and some true grit and determination. It’s an impressive feat to say the least. However, as is almost inevitable when it comes to fine displays of athletic ability, it won’t be long before someone comes along and outdoes your achievement in less time. Double back flip in five hours anyone? I mean I definitely would try it, but I don’t have a garden… or a mattress… and I’ve just remembered I have a thing I’m supposed to be at… see ya!